STORRS - It may have changed head coaches, but the UConn men’s basketball team must still deal with an NCAA investigation into aspects of its recruiting in the last few years. 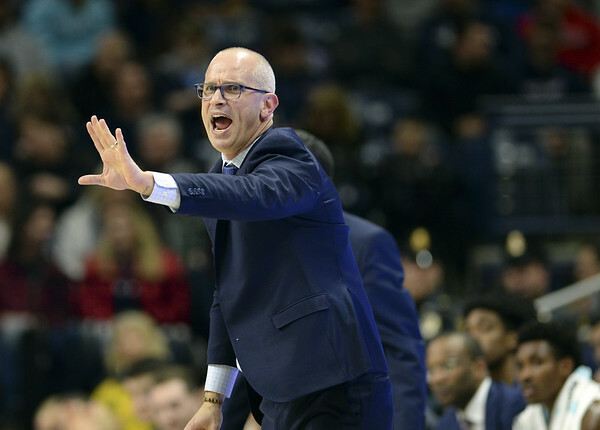 But when he asked during the interview process, Dan Hurley was apparently satisfied with the answers he was given in regards to that inquiry. At least enough for him to accept a contract as the program’s next head coach. Hurley met with UConn Athletic Director David Benedict and President Susan Herbst on Monday, and admits he was very inquisitive about plenty of issues, including potential NCAA infractions. “I asked the questions. I didn’t ask questions, like about the APR, when I took the Rhode Island job and then I found that present under my Christmas tree,” Hurley said. “So I was a lot more prepared going into this interview. Neither Benedict nor Hurley would get into specifics about their discussion. Benedict seemed to feel the NCAA issue was a minor concern of Hurley’s. When he was a player at Seton Hall, Hurley played against the Huskies on seven occasions. His teams fared reasonably well early in his career, with the likes of Terry Dehere leading the Pirates. But in Hurley’s final college basketball game, the Huskies gave him a rather unceremonious sendoff. Hurley’s stat line from that March 7, 1996 game was in fact not pretty. He shot 1-for-13 from the field, including 1-for-8 from 3-point range. He finished with four points and three assists in what was a 79-58 UConn win over Seton Hall in the quarterfinals of the Big East Tournament. “But Ray was a total class act. He kept asking me how I was doing,” Hurley deadpanned. Hurley, who averaged 14.3 points and 5.2 assists as a senior at Seton Hall that season, finished his playing career against UConn with three wins and four losses. Posted in New Britain Herald, UConn on Sunday, 25 March 2018 21:06. Updated: Sunday, 25 March 2018 21:08.